Semiconductor sales rose 2.2% in April from the month before, bringing in $23.6 billion in sales and surpassing the November 2007 record, according to the closely watched Semiconductor Industry Association monthly report released Tuesday. The 2.2% increase, based on a three-month moving average, marks the second month in a row that the industry has posted growth, a stark contrast to last year's weak performance. April's sales soared 50.4% over the same time last year, when the industry was at a low point. 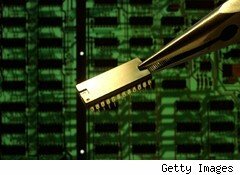 "Important contributors to current growth of semiconductor sales include the worldwide adoption of 3G wireless communications and consequent investment in infrastructure and recovery of demand from the enterprise, automotive, and industrial sectors," said SIA president George Scalise in a statement. The April sales performance came in stronger than some analysts had expected, including Ross Seymore of Deutsche Bank, who had anticipated something around $20 billion. "Sales are strong again, even though April is usually down sequentially," says Seymore. For the full year, Seymore is anticipating revenue growth of 25% over 2009. The SIA, which is expected to release its midyear forecast on June 10, expects the industry to return to its historical seasonal patterns in the near future, assuming the global economy and emerging markets continue on their recovery path. Despite an improvement over the previous month, the Philadelphia Semiconductor Sector Index was down 0.69% to $353.21 in early afternoon trading, while the Merrill Lynch & Co. Semiconductor Index had dipped 0.04% to $27.41.